A really simple way to roast pork giving a delicious sweet and sour, sticky coating which is perfect served with wilted greens and rice noodles. Free range pork is available from the service meat counter, or British pork shoulder steaks can be used from the prepack meat cabinet. Free range pork offers great tasting, great quality pork while ensuring high standards of traceability and welfare. Preheat the oven to 180°C, gas mark 4. Season the steaks with the pepper. Place them in a single layer in a roasting tin and drizzle over the oil, soy sauce and Chinese wine. 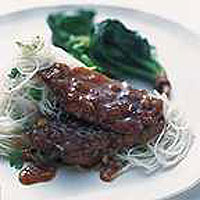 Sprinkle with the shallots and garlic and spoon over the hoisin sauce. Cover and leave in the fridge on the bottom shelf for 20 minutes. Drizzle the steaks with half the honey and roast for 20 minutes then turn and drizzle with the remaining honey and cook for a further 10 minutes until piping hot throughout. By this time the meat should be slightly charred and cooked. Serve immediately with Sharwood's Rice Noodles, cooked according to instructions on the packet, and wilted greens, such as pak choi.